Lumineers in Medford offer a noninvasive alternative to traditional porcelain veneers. These ultra-thin coverings remake the appearance of a cosmetically imperfect smile without affecting your healthy natural teeth. Because they don’t require any preparation, Lumineers can be completed more quickly and comfortably than traditional porcelain veneers. Dr. Gary Rosenfeld is pleased to offer this treatment option for patients at Island Daily Dental Care. Just like with traditional porcelain veneers, Lumineers can dramatically enhance the appearance of the smile by covering up any number of cosmetic imperfections all at once. Lumineers, however, are a specific brand of veneers that are much thinner than the traditional restorations. Because they are so thin, they can be applied to the surface of the teeth without any removal of the healthy tooth enamel. Lumineers are a more conservative cosmetic option compared to traditional porcelain veneers. They can be placed in just two simple, comfortable visits to Island Daily Dental Care. Many adult patients who are interested in dramatically improving the appearance of their smiles are eligible candidates for Lumineers. However, they are not the best option for everyone. Because they are applied directly onto the natural teeth, patients who have puffy lips or teeth that jut out may find Lumineers look too bulky in their smile. Patients who have severely misaligned teeth should first seek orthodontic treatment to correct the bite. Lumineers should also be applied to smiles with healthy teeth and gums — gum disease can affect the success of traditional veneers and Lumineers. We will schedule a checkup and cleaning to ensure your smile is healthy enough for any type of cosmetic dentistry. Lumineers are placed over the course of two easy visits to our Medford office. 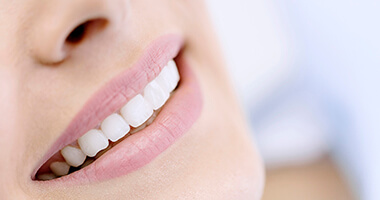 First Visit: We will thoroughly discuss your treatment options and consider your smile goals to ensure that Lumineers are the best option for your smile. Once we determine that they are, we will take impressions and photos of your teeth and send this information directly to the authorized Lumineers lab. Second Visit: After about two weeks, your Lumineers are ready to be bonded into place. Return to our office and we will temporarily apply the veneers to ensure they fit and function like they should. We can still make adjustments at this point. Once we have confirmed that the Lumineers fit properly, we will etch the surface of the teeth to help them attach securely with the teeth, then bond them on one by one. Visit your cosmetic dentist in Medford to get started discussing what’s possible for your smile with Lumineers! We can’t wait to reveal your very best look. Schedule an appointment at Island Daily Dental Care today.